Hibiscus House is an open, airy oasis that sleeps 6 in luxurious comfort. The three bedrooms are spacious and private; two have en-suite baths. The brand new chef's kitchen opens onto the dining area that seats 6. The comfortable living area flows onto the poolside patio for true indoor-outdoor living. The pool area is secluded and quiet, with comfy sofas and chairs for curling up and watching the kids play in the heated pool. The house is located in a quiet residential neighborhood just a short walk to the beach. Park your car at the house and your entire vacation is walkable! Grab your beach towels and umbrella (and the boogie board, theyre all provided) and stroll to the beach entrance right at the end of Hibiscus Avenue. 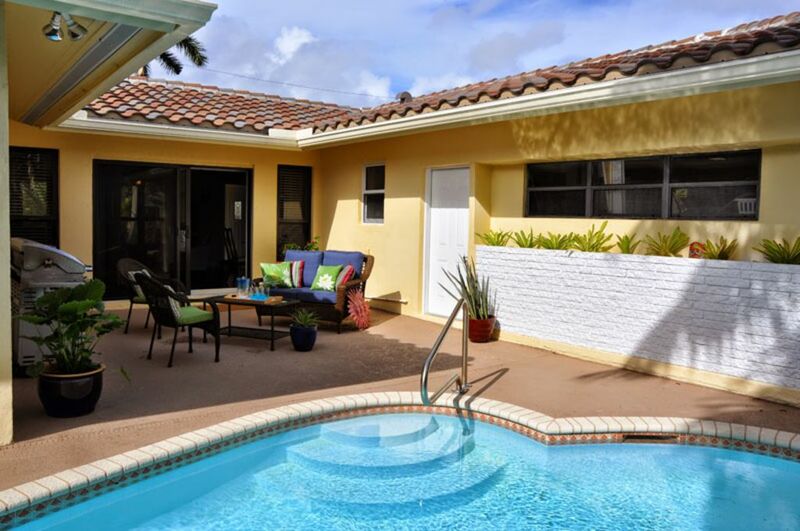 Hibiscus House is located in lovely Lauderdale-by-the-Sea, South Floridas only walkable beach town, located on an island between the Intercoastal Waterway and the ocean. Large towers are prohibited here, so all buildings are lower than the coconut palms! The charming downtown has loads of shops, casual and classy restaurants, ice cream - even a fun pier extending out over the Atlantic for fishing or just a sunset stroll. Hibiscus House has an amazing chef's kitchen, but you may just want to dine out at a different restaurant every night of the week! Best of all, this little town is just a quick drive from the fun offerings of Ft Lauderdale, Miami, and West Palm Beach. The free Pelican Hopper shuttle travels the length of this island town and connects to the county bus network. There is parking for 5 cars outdoors on the property (the garage is for owner use only). Lauderdale-by-the-Sea is very walkable - the beach is just over 5 minutes walk and downtown is around 10 minutes. The B-Cycle bike share has a station in Lauderdale-by-the-Sea and allows you to grab a bike and drop it at any of the 20 stations along the beach all the way to downtown Ft Lauderdale. Guests have full access to the house and grounds. Parking in the garage is for the owner but guests may use the laundry facilities and pool/beach equipment stored in the garage. Guests will receive directions to the house and house information and rules upon booking. Guests receive a code for the front door, so no one will be present during your stay. The property manager is available by phone or email during normal business hours. NOTE: You will receive a rental agreement via email upon booking. Receipt of your signed rental agreements is required before your booking is considered confirmed. We DO NOT list our home on Craigslist! If you see it posted there, it is not legitimate. Please report it on that website. Booking through HomeAway/VRBO guarantees your (and our) protection from fraudulent activities. Erik and Steve currently live in New York City with their two kids, but Erik grew up just a few miles from Hibiscus House in Ft Lauderdale. Hibiscus House is located on an island between the Intercoastal Waterway and the Atlantic Ocean. There are several beach access points within a 5 to 7 minute walk of the house. Comfortably seats everyone in your party on a plush sofa and two armchairs. The living area flows into the seating area on the pool patio, with another sofa and two additional chairs. Paper towels provided plus limited cooking basics. Grocery shopping is a short drive away. Plenty of plates, bowls, silverware, cups, mugs, pots, pans.... everything you need for cooking! Brand new chefs kitchen with plenty of room for cooking and entertaining. Includes brand new appliances and everything you need to enjoy your stay. 6-person dining in the open plan living and dining area, just off the kitchen. Another dining area is located on the pool patio with seating for 6 and a barbecue gas grill. Wireless Bluetooth speaker provided. Connect with your phone and play your music from your personal library, Pandora, Spotify, etc. Quiet pool patio with sofa and chairs in the back garden. There is an outdoor dining table that seats six on the pool patio. Covered front porch with chairs and a table. Beach towels and a cooler are provided, together with a cart to wheel down to the beach (a 7-min walk from the house). Some beach toys and boogie boards are usually available from prior guests. Beautiful, secluded pool in the back garden. Pool can be heated during colder weather for an additional weekly fee. For baby gear (high chairs, cribs, pack and play, etc) we highly recommend renting from Baby Borrow Rental in Ft Lauderdale. They will deliver items directly to the house and pick them up after your departure. Their gear is top quality, name brand, clean and well-maintained. We have used them for our own children. Very nice house in a perfect area. Walk to beach and downtown Lauderdale by the sea. Kitchen perfect with evrything you could ever need. Only complaint is the sheets need to be updated. Bottom sheet kept coming off the bed and not great quality. We were very happy with this location. It was exactly as the pictures portrayed it. Very clean and well taken care of. The only issue was I didn't get the welcome packet with the door code, but a text to the owner resolved it quickly. You will also get a text on your check in day to make sure everything is ok. This house is really setup for 6 guests even though it says max 8. There are two twin air mattresses for guests 7 and 8 but my son just used the air mattress sheets and slept on the couch. There are plenty of sand toys, beach umbrellas, stroller, highchair, pool floaties, drying rack, you name it in the garage. You wont need anything like that. There are also regular umbrellas and blow driers in the bath rooms. The kitchen is well stocked with dishes, pots and pans and has items left from other guests like spices. We used a few and added to it. The location near the beach, restaurants, pier and the small pool is what makes this place. Walking to the beach is about 5-10 minutes depending on your age. We were able to push grandma in a wheelchair all the way to the edge of the sand no problem. The beach here is nice. The water is clear on calm days. Fishing on the pier was fun and many fish were caught although they were all small. The house is at the end of a dead end street so traffic is almost non existent which is good for kids and noise. The area is a very quiet well taken care of neighborhood. If I go back to Lauderdale-by-the-sea I would stay here again. The property was clean, furniture very comfortable, kitchen very well equipment, towels and bedding of a very good standard. The property location was in a quiet but accessible location with small walking distance to the beach and the restaurants. The pool area was lovely, the patio area had the sun most of the day and the pool was warm, clean and the kids loved it. A nice home in a quiet area. Its our 5th home rental in Florida in 6 years. We base our selections on reviews and this home was perfect. With 4 adults and 4 Kids in the house, the spacious home gave us plenty of living space. With 3 large bedrooms, large living room , 2 full bathrooms with showers and a large kitchen. The nice pool was perfect. In a quiet area hidden from traffic and noise, sleeping was a charm in comfortable beds. The A/C was efficient and not noisy. The kitchen was fully loaded with its accessories. Walking distance to Lauderdale by the Sea Beach, the Pier, shops, and Restaurants. Close to Fort Lauderdale Beaches, Sunrise and Las Olas Boulevards. Erik answered all our questions quickly and clearly. The rental transaction was simple and easy. Thank you Erik. We will refer your home to family and friends. Cheers. An amazing house in tropical garden in a quiet neighborhood just a walk to the beach...and what beautiful beach. Great home for family with all the amenities! We stayed here for a week with our three children. Everyone loved the home and pool. Home was stocked with all your cooking needs. Well kept and super clean. It felt like home to us. The neighborhood is great as well. All the amenities anyone could ask for with lots to do close by. Highly recommended and look forward to staying here again! Hibiscus House is located in lovely Lauderdale-by-the-Sea, South Florida's most walkable small beach town, located on an island between the Intercoastal Waterway and the ocean. Large towers are prohibited here, so all buildings are lower than the coconut palms! The charming downtown has loads of shops, casual and classy restaurants, ice cream - even a fun pier extending out over the Atlantic for fishing or just a sunset stroll. Best of all, this little town is just a quick drive from the fun offerings of Ft Lauderdale, Miami, and West Palm Beach. Rental agreement and House Rules will be emailed upon booking. Your reservation is not final until we receive signed copies of the rental agreement.